The third month of pregnancy includes weeks 9 through 12. The end of this month is the end of the first trimester. After the third month of pregnancy, your baby is fully formed and the risk of miscarriage drops significantly. Lots of development occurs during this month. for Baby: Your baby is approximately .9 inches long. This week the embryonic tail disappears. The hands and feet have formed fingers and toes. Your baby has developed eyelids which are fused shut for another 16 weeks or so. for Mom: Your waistline might be starting to expand, but you won't look noticeably pregnant yet. Due to your increased blood volume, your heart is pumping overtime and you may find yourself struggling to catch your breath at times. for Baby: By this week, all your baby's internal organs ave formed and they are beginning to function. Your baby is growing nails on its fingers and toes and tiny buds for teeth. Baby is approximately 1.2 inches long. for Mom: Your uterus continues to grow and expand to accommodate your tiny growing baby. You may notice your clothes getting a little tight, though you won't have a noticeable 'bump' yet. 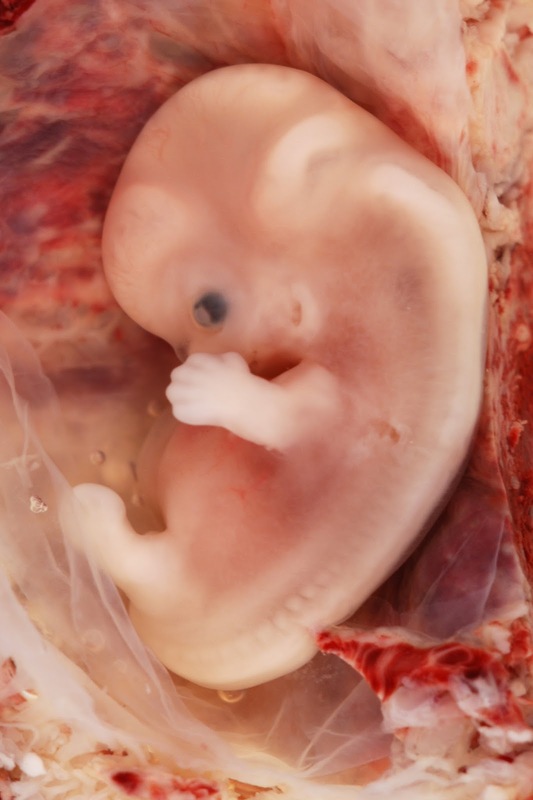 for Baby: This week your baby is officially a fetus. The most vital internal organs have developed. Your doctor will be able to detect baby's heartbeat using a fetal doppler. Your baby is currently about 1.6 inches but will double in size by the next week. for Mom: You may start noticing some new and unusual pregnancy symptoms including: rapidly growing hair and nails, oily skin, acne breakouts, bleeding gums as well as the morning sickness and fatigue you've been experiencing thus far in the first trimester. for Baby: Your baby's facial features are becoming more developed. The eyes have moved forward towards the front of the face, the ears have moved to the side of the head, a tiny nose and chin are taking shape. Your baby's brain is forming synapses. Your little one is approximately 2.1 inches by this week. for Mom: As the first trimester comes to an end, some of the symptoms may diminish, such as morning sickness and fatigue, although some women experience those symptoms their whole pregnancy. Your uterus is getting too big for your pelvic area and may begin to rise. You may start to look pregnant. Treat yourself to some new, comfortable maternity clothes with room for your growing belly. You may notice changes in your skin, dark patches or a line down your belly. These are normal and usually disappear after pregnancy.